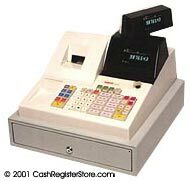 Sanyo ECR-240 Electronic Cash Registers at Cash Register Store. The Sanyo ECR-240 is a full-featured electronic cash register. It provides cost-effective transaction control and valuable sales information through many advanced features that usually are found only in more expensive units. The ECR-240 uses a single station printer featuring 20 departments standard. It has customized store-logo capability. The ECR-240 is a newer system recently released from Sanyo's factory. The ECR-240 is a very nice low cost cash register system recommended for a small business. Digital wheel printer, 3.2 lines per sec.